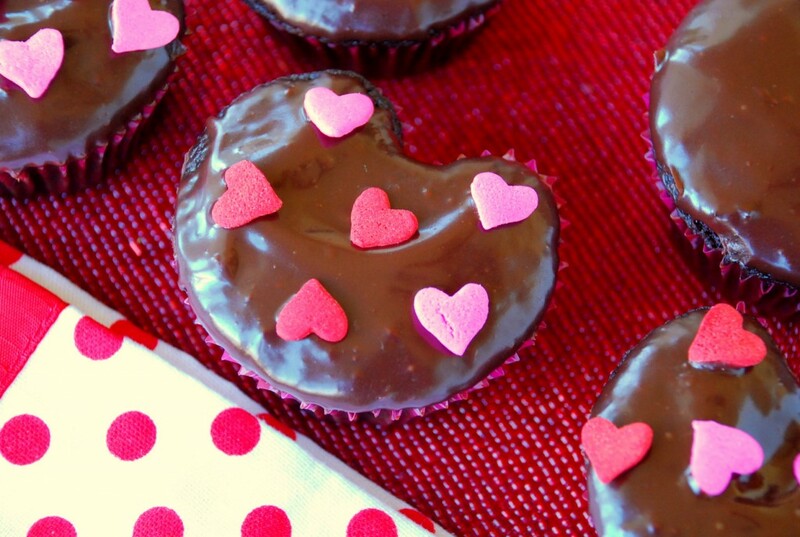 These little heart-shaped cupcakes couldn’t be sweeter. Or simpler. You don’t need a fancy pan, just a regular cupcake tin and some er, marbles. Yes, you read that correctly. You need to go dig under your sofa cushions and dig out some of your kids’ Cheerio-crusted marbles. Or maybe that was just me. If you don’t have marbles, you can roll small pieces of tinfoil into marble-sized balls. For the cupcakes, you can make the chocolate cupcake recipe of your choice. I made this one from Cooks Illustrated, which is supposed to be the best scratch cupcake ever, but can I tell you my favorite is still the Too Much Chocolate Cake recipe, which starts with — you guessed it — a box mix. It’s unbelieveable. You must use cupcake liners to make the hearts correctly. Fill the liners 2/3 full — NO MORE THAN 2/3 FULL, DO YOU READ ME? OR YOUR CUPCAKES WILL RISE TOO FAR ABOVE THE MARBLE AND LOSE THE HEART SHAPE — and then place a marble in each cup. See picture. I’ve experimented with how far to push the marble down, but it really doesn’t matter. They all pretty much turn out the same. Bake cupcakes as directed and let cool in cupcake tin with marbles. Prepare chocolate ganache and dip the tops of the cupcakes in the ganache. Twirl slightly before turning right side up to remove extra ganache. Let set for a few minutes and adorn with sprinkles. Place chocolate in a small bowl. In a small saucepan, bring cream just to a boil over medium heat. Pour over chocolate; let sit for 3 minutes. Whisk until smooth. If you want it thicker, let it sit for a few minutes. Dip cupcakes as directed above. This should cover about 18 cupcakes. You may have some extra ganache. Sorry about that — you’ll need to save it for drizzling on your husband on Valentine’s Day get a spoon stat and finish it off yourself. Just made these for the PTA teachers dinner tonight. I hope they feel loved!